Cave In headlined a show tonight (June 13) at The Royale in Boston, MA to help raise money for the family of deceased bassist/vocalist Caleb Scofield. Also performing were Converge, Old Man Gloom, and The Cancer Conspiracy. Notably, taking Caleb's place on bass for a portion of the set was his brother Kyle, also an experienced bass player. After introducing Kyle to the crowd, Cave In frontman Stephen Brodsky added, "It feels really good to have some Scofield blood up here with us." 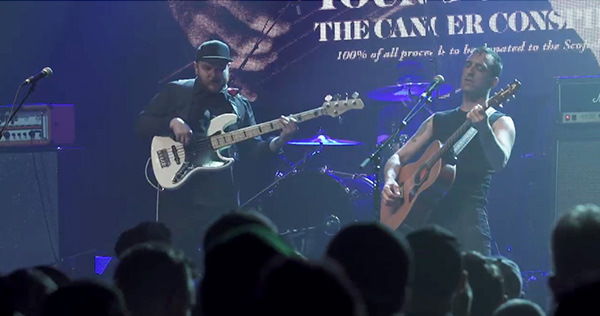 Among the songs the band performed with Kyle Scofield were "Youth Overrided," "Heartbreaks, Earthquakes," "Tension in the Ranks," and Neil Young's "Harvest Moon." Converge's Nate Newton then took the stage to add his bass expertise to the proceedings, which included "Dark Driving," "Off To Ruin," "Trepanning," "Big Riff," and "Sing My Loves." The collective also performed some material from Zozobra, the band Caleb Scofield founded.